4.16.2019: Department of Buildings issues Partial Stop Work Order due to falling construction materials. No work to proceed on the exterior of the structure. 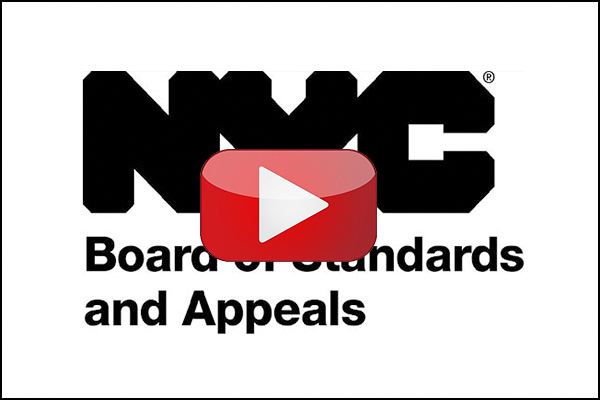 3.15.2019: State Supreme Court vacates and annuls Board of Standards and Appeals prior ruling as unreasonable and inconsistent with the plain reading of the Zoning Resolution and sends the building permit for 200 Amsterdam Avenue back to the BSA for review. READ the full press release by the Municipal Art Society and the Committee for Environmentally Sound Development, the plaintiffs who challenged the project. Read the court’s 200-Amsterdam-Decision_14March2019. While there may be two sides to every story, there are seldom 39 sides to a zoning lot! 200 Amsterdam Avenue is a unique development scenario. Developers SJP Properties and Mitsui Fudosan America are proposing a 52-story residential development of 668 feet–the equivalent of a 66-story midtown office tower–at the intersection of Amsterdam Avenue and 69th Street. The site was formerly home to the Lincoln Square Synagogue, which relocated further south in a land swap. Availing themselves of the mid-century urban renewal superblock site, the developers have gerrymandered a zoning lot across several tax lots to assemble enough FAR to create what would be not only the tallest building in the neighborhood, but also the tallest building north of 59th street on the island of Manhattan. Despite a Zoning Challenge and an appeal to the Board of Standards and Appeals (BSA), construction work continues. Since initially granting this building a permit, the Department of Buildings (DOB) has revised their protocol, issuing a statement that this lot and building height should have not been allowed. 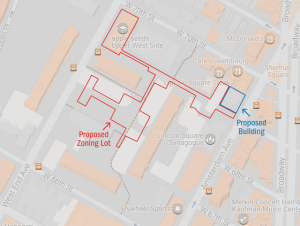 (See graphic at left showing the red-outline of the gerrymandered lot, cobbled together from portions of tax lots, that supposedly supports the small blue building lot). The DOB has also prepared a bulletin to clarify zoning intent so that this never happens again. …but isn’t that the equivalent of situations where Department of Buildings has a practice- ongoing- does not hold that practice, and then the BSA says that this is the wrong interpretation and DOB must stop. It is a similar situation, in that DOB, up until the BSA ruling, is still practicing according to its current interpretation. So why is this different? …precisely our question as well. A follow-up hearing of the BSA was scheduled for Tuesday, June 5, 2018. At that hearing, further testimony was given, and the hearing was closed. 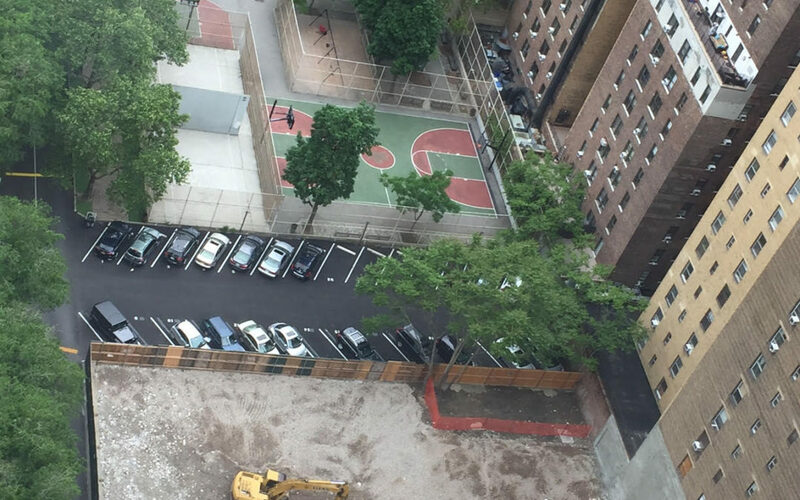 Lawyers for the Appellant, the Developer, the Department of Buildings and a representative for 170 West End Avenue now have until June 24th to submit up to 6 additional pages of documentation. The next (and presumed decision) hearing of the BSA on this item was scheduled for Tuesday, July 17, 2018. As planned, the vote took place. In a vote of 3 to 1, the BSA sided with the developer and denied the community’s appeal. 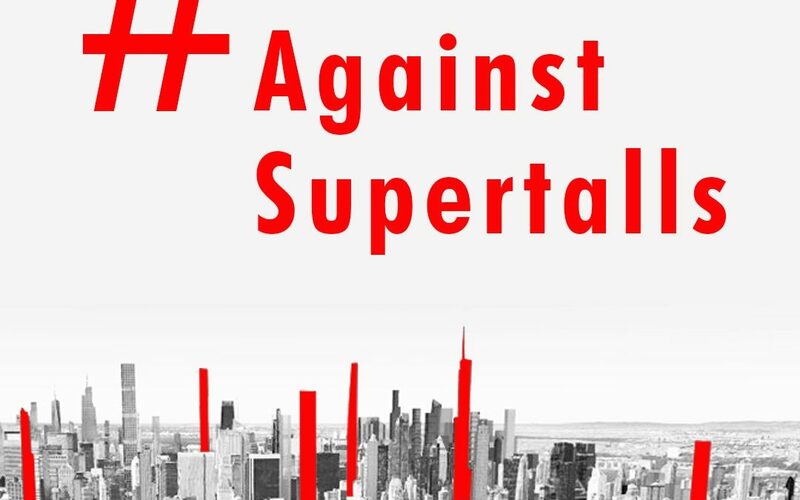 Previously, Council Member Helen Rosenthal organized 27 of the 51 City Council Members to close a loophole by asking the BSA to refuse to allow gerrymandered lots. Read the full letter to see if your CM signed on! 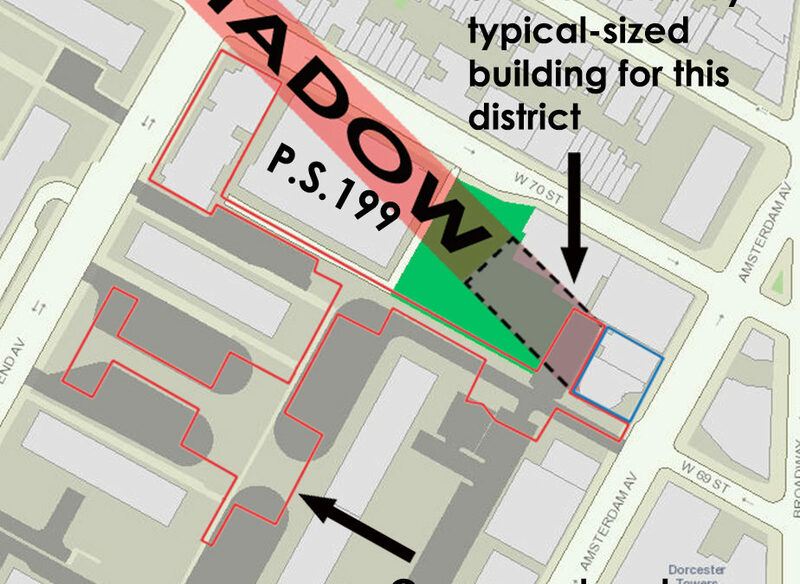 Read through our blog updates below for more history on this critical zoning matter. Become a member of LANDMARK WEST!